I'm having trouble peaking up my Tooway system. My reseller is unresponsive to emails and phone calls, so I'm on my own. I'm on an island in the Adriatic, in the centre of Blue 1. From installation I've had a maximum of 13.5dB, but recently this has dropped. I did a re swing of the dish and the best I can now receive is 10.5dB. I found when I was up the ladder the the earth lead has disintegrated in the high UV here. Can that cause TRIA problems? There are lots of mention of Peaking up but no descriptions of how to do it. I don't have a meter, so use the TRIA tones with a portable wifi device showing the INSTALL page readings to help and very small changes to the bolts, but still can't get above 10.5. I don't know why the RX SNR has changed. Any advice would be appreciated. I can't think of good idea why the RX SNR has gone a bit low. If you are the middle of a beam you should stay in that beam. If you are where beams overlap it is possible that your tuning and polarisation might jump from one beam to another and so give different readings. The damage to the earth cable is interesting. It looks as though the copper cores have disappeared. Have you had any thunderstorms ? There may have been severe corrosion caused by moisture aggravated by steady long term electric current flow. There should be no current flow in the earth wire. But there is, sometimes, due to 1) poor connection of the coax (The DC supply current to the LNB/BUC then goes via the earth wire rather than the coax sheath) 2) due to mains current from the house going via coax sheath rather than the house earth/neutral. The earth wire provides some protection against electric shock and fire in the house if you have lightning strike and is a legal requirement in some places. If you have earth wire and metal pole into real ground then the outdoor end is truly earthed. An electrician should be consulted if you have have 'PME' system. The coax cable from outdoor to indoors can provide a connection between the house earth or neutral mains connection and the real earth. Here there is hazard in some places. The house neutral or earth wiring may be floating at some voltage above the true ground outside and the coax provides a true current path to ground. There is a real hazard if a house or block of flats develops a an open circuit neutral fault as the entire house domestic mains supply current then flows to ground via your earth cable. If I was replacing your earth cable I would first unplug the indoor equipment completely from the mains sockets. I never hold the outdoor end of a coax until I have measured the voltage between the end of the coax and the local ground! Should be zero AC and DC. Take care. Hi Eric, Thanks for your detailed response. I think I've been abandoned by the company so will be sorting this myself! On the subject of the beam, I also do not understand the drop, nor why I can't, with careful adjustment, get it up. However since last week AND not having touched the dish, today it is up to and steady at 11.2dB, so there is something going on that I can't understand. The dish is solid and does not move. It is high summer, with a daily max of 35C. I even wondered if it was due to metal expansion? As for the earth cable, I also have never seen that kind of failure. The dish was installed by a company installer. When he put it up, on the gable end of a stone building, I asked about the earth, and the need to connect it to "Ground" but he said it wasn't necessary. Yes, we get a lot of thunderstorms, but have had no nearby strikes. The dish is below the roof top and well below the mains electricity pole on the end of the house, which does have ground protection. So while the TRIA is (or was) bonded to the dish frame, the frame is just bolted to the wall, without any further bonding. The rubber sleeve/heat shrink is still in place at both ends |(moisture ingress protection?) and the damage is limited to the vertical wire run close to the frame. It almost looks as though it has been eaten? As the coax is in its own, separate conduit from the outside wall to the internet distribution box in the hall, where the satellite modem is, I'm not sure how main current would get into the sheathing? I think I need to check the coax at the TRIA when I do the replacement work. I haven't touched the earth, as I am aware of the potential for it to carry current, and will turn the system off and unplug, as you suggest before replacing it. The danger is magnified when you are at the top of a ladder!! I don't have a PME. This is southern Europe, where there is no earth on the incoming power, instead every property has it's own, sometimes, with mine, the earth from the consumer unit goes via the meter box to the underground steel rising water main. Perhaps a case of "If it works, don't fix it" ! I think there are four downlink carriers to customers per beam.
. 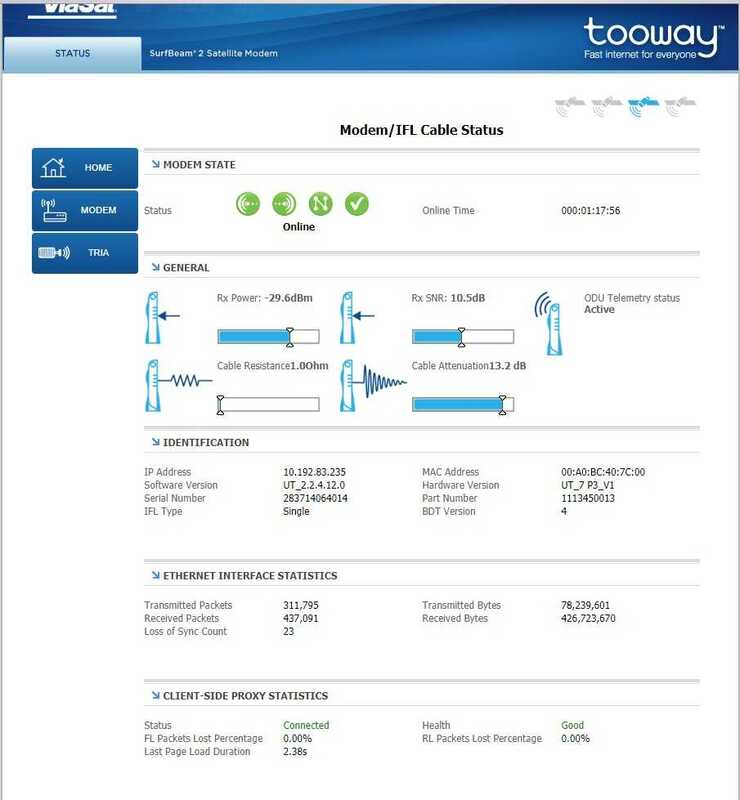 It is normal the carrier levels and C/N to vary due to rain and other factors at the uplink gateway site.
. During any level degradation event at either the gateway or individual customer site the system incorporates automatic adaptive compensation to maintain the service. For example, a customer might, in clear sky, receive 20 Mbit in one second, made up of stream of short bursts each at 125 Mbit/s, the gaps in the whole second being filled with traffic for other customers. During rain the 20 Mbit in one whole second can be achieved by using more rugged bursts at say 62.5 Mbit/s, but still leaving gaps in the whole second for other customers. This variable burst bit rate is called adaptive modulation and coding, using MODCODs varying from highly efficient but delicate 8PSK 0.8FEC to very rugged QPSK 0.5FEC. If a site is at beam edge or mispointed it is relatively degraded but the customer will notice no difference as it makes no difference to the end to end 20 Mbit per whole second. Similarly a site at beam centre with good pointing gets the highest feasible burst bit rate, but still gets 20 Mbits total per second leaving more time for other customers. Tech note: The 'bursts' referred to above are actually different MODCOD frames within the DVB-S2 carrier frame structure. The carrier has a constant symbols per second rate. 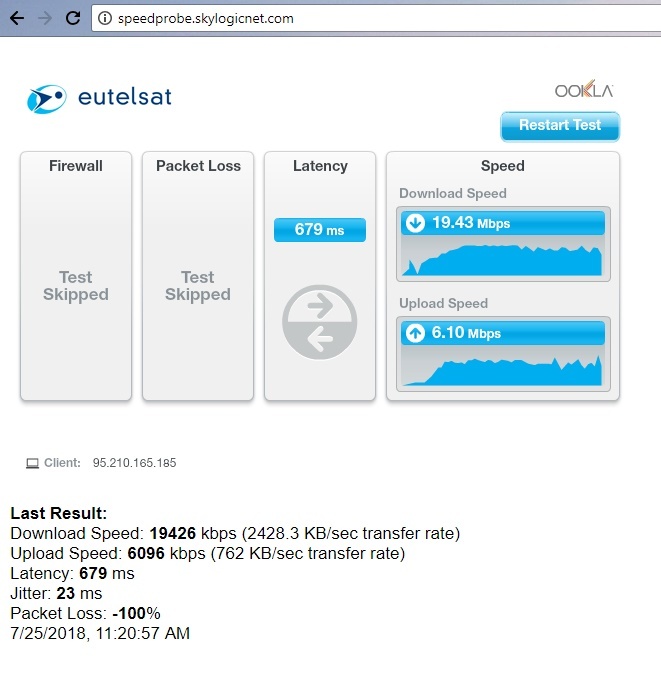 The outlink download carriers to the customers are continuous, not TDMA. A typical DVB-S2 carrier has a constant symbol rate and a structure made up a blocks of different bit rates and modulation/coding types, say 64, 50 and 21 Mbit/s, and the proportion of each type, say 0.95 8PSK, 3/4 8PSK, 1/2 QPSK, will depend on the distribution of types of weather across the beam coverage. Tooway : My guess as to how it works !